The redevelopment of the Wayzata Bay Center is envisioned as a vibrant mixed-use district in downtown Wayzata, Minnesota. On a 13.5 acre site divided into five distinct blocks and a central plaza, retail activities are mixed with senior and conventional housing, offices, and a hotel. The Wayzata Bay Center offers a synergistic mixture of uses, an inviting pedestrian environment, ample green and public spaces, enclosed and street parking, state-of-the-art infrastructure, and sustainable design. 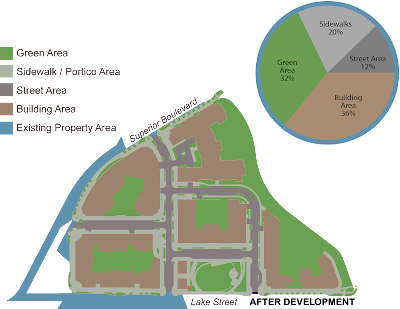 Rather than a single project area, the Wayzata Bay Center tract has been integrated into the town fabric by subdivision into smaller blocks served by new interior streets. Streets are organized to create extensions of other downtown streets or to make logical intersections with driveway entrances serving nearby properties. While these streets will be private, they will be publicly accessible at all times, and they will be designed to the scale of other downtown streets. All interior streets will measure 72 feet between primary building faces, with two drive lanes and parallel parking bays. A range of streetscape designs incorporate plantings, brick pavers, and exposed aggregate concrete panels. Walled gardens mark the gateways to the site, and street patterns take cues from the existing patterns of Lake Street, landscape features of the site, and the orientation and focus of each street. 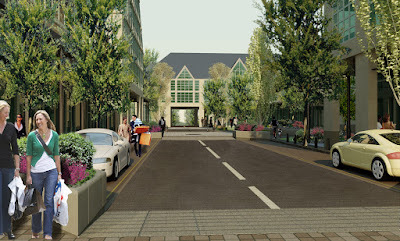 A variety of street trees will be planted throughout the site. The project’s structural system allows the advantage of the importation of planting soil appropriate for each type of tree, creating a growing environment that encourages the trees to flourish and eventually reach sizes not often seen in urban environments. The redeveloped Wayzata Bay Center is an integral part of downtown Wayzata. As a vertical mixed-use project, it represents a traditional town form. Shops and retail activities line pedestrian-oriented streets, with a focus on the central Park Plaza. 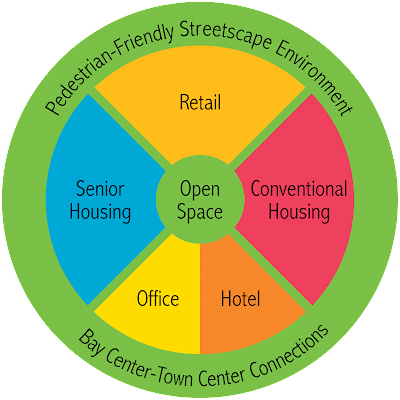 Senior and conventional housing provide residents who will patronize shops and populate sidewalks. 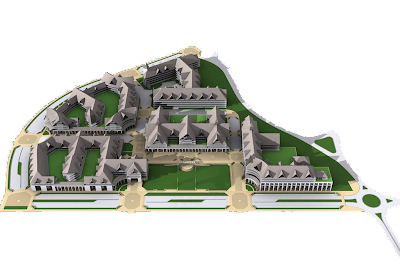 The division of the site into blocks results in a fine-grained approach to redevelopment, with a variety of building levels and roof lines. With a pedestrian realm of the highest quality, the synergy of mixed uses, and the incorporation of sustainable features and innovative infrastructure, the Wayzata Bay Center has become a vibrant commercial and residential district in Minnesota. The Wayzata Bay Center includes spaces intended for public use throughout the site. A one-acre Park Plaza occupies a prominent position on Lake Street and is the public centerpiece of the redevelopment. It is conceived as a ‘town green,’ a space that can accommodate a wide range of activities and events while remaining a comfortable part of the Lake Street environment when no scheduled activities are present. 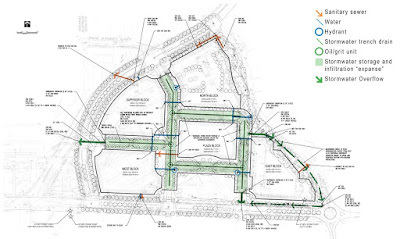 The edges of the Park Plaza will be landscaped with paths, trees, and garden elements, while the central lawn area will be developed with an engineered turf that allows for quick recovery after events, an irrigation system, and a resilient turf grass. The most obvious factor of sustainability is, quite simply, the reuse of the site itself. While the Bay Center was a large wetland before it was developed, the construction that occurred and changes in surrounding land uses make it unfeasible to return it to that condition. But an evolution of the site through redevelopment keeps development focused on lands already served by urban services, keeps community goods and services in the center of the community, and forestalls the expansion of the built environment. 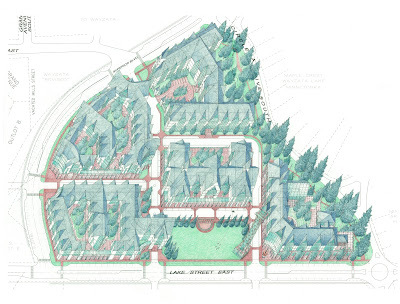 Due to their long-term commitment to a presence at the Wayzata Bay Center, Presbyterian Homes determined that its plan for redevelopment would place great emphasis on the creation of a sustainable environment, using high-performance design and the best practice models for site infrastructure and building systems. Though none of these practices are particularly new or wholly innovative, taken together they stand as a testament to ways in which redevelopment projects can push the bounds of sustainability for the benefit of the development and the community. 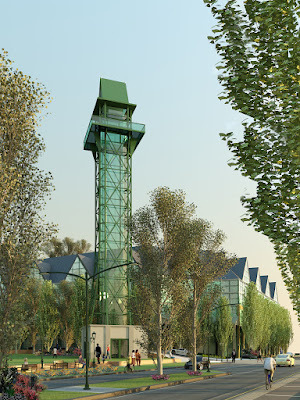 The Campanile is proposed in the Park Plaza near the West Block. A landmark that orients people to the community from Lake Minnetonka and the surrounding area, the campanile is also an attraction in itself, offering visitors a chance to climb (or take an elevator) to an observation platform with panoramic views of Wayzata and the lake. The Conservatory, an indoor garden for all-weather public use, occupies a small building next to the Campanile at the west end of the Park Plaza. It offers indoor space for informal community activities. When coupled with the Campanile and its views of the area, the Conservatory becomes a unique attraction. Pedestrian comfort is key to the streetscape experience. 52% of the site is walkable. The standard sidewalk within the redevelopment district will be 16 feet wide, with 20% of the site dedicated to sidewalks. 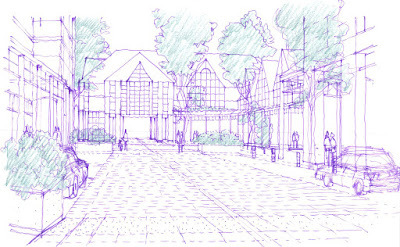 Much of the sidewalk area is planned to be covered by porticos or loggias to encourage all-weather use. In the winter, heated sidewalks and streets will melt snow and ice. Within the six-block redevelopment district, there is over 200,000 square feet of green space, including the public Park Plaza along Lake Street and a linear park along the eastern edge of the site. This will be the most pleasant and distinctive pedestrian environment in the Twin Cities area. 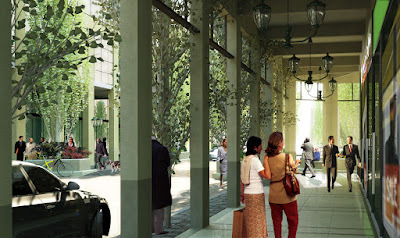 Reuse of sites through redevelopment is recognized as one of the key principles of sustainable design. 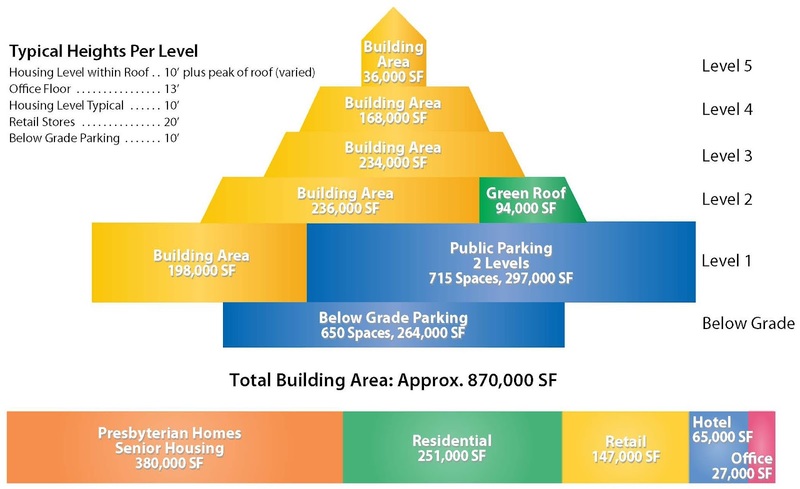 Land use efficiencies are achieved through the project’s vertically mixed use design. Common open spaces (32% of the site), extensive sidewalks and trails (20% of the site), enclosed parking, and other amenities are organized for maximum efficiency on the site. Redevelopment also provides an opportunity to address existing soil and groundwater contamination issues on the property. The site is structured to direct nearly all of the runoff generated on the site into understructure storage and infiltration basins located below portions of the project’s interior streets. To further reduce runoff, the design also incorporates the use green roofs at the top level of all parking garages.